I don't know about you, but ever since my daughter started preschool I've been afraid she is going to get head lice. I am afraid for no other reason than I have heard they can be hard to get rid of, and I really don't want to deal with them. I must start by saying the having lice is NOT a sign of uncleanliness. Lice affect people of all socioeconomic levels and all levels of hygiene. I spent quit a bit of time online and questioned our pediatrician about lice prevention before my daughter went to preschool. Lice prevention came down to one basic principle: The best defense is a good offense. While these methods won't guarantee your child won't get head lice, they can reduce the likelihood of it. 1. I know we all spend a lot of time telling our kids to share, but not everything is meant to be shared. Tell your kids not to share brushes/combs, hats, scarves, hair accessories, towels, helmets, etc. with other people. It doesn't matter if you think they have lice or not, symptoms my not show up until an infestation is in full swing (sometimes that can take 4 weeks). 2. Tell your kids not to lie on bedding, pillows, stuffed animals, or carpets that someone with lice has recently used. Lice can live up to 48 hours with no human contact. 3. Tell your kids to try to avoid head-to-head contact with other people. 4. Use a tea tree oil infused shampoo, or make your own (recipe below). Tea tree oil is naturally non-toxic, anti-bacterial, and anti-fungal. It is commonly used in the treatment and prevention of lice and dandruff. My hair dresser recommends a leave-in conditioner. The conditioner says it keeps lice and other insects away. It is called Fairy Tails Repel Leave-In Conditioning Spray*. 1. Using an eye dropper, add 2 drops of tea tree oil per ounce of shampoo. 2. Replace the shampoo bottle lid and shake to mix. 3. Shake shampoo before each use. 4. Use shampoo as you normally would. -Do not ingest tea tree oil. -Do not use tea tree oil undiluted. -Watch for allergic reactions, especially if it is your first time using tea tree oil. -Do not use tea tree oil if pregnant and breast feeding. Do you have any lice prevention tips you could share? Are you sure you are using the correct Tea Tree Oil? I was told Tea Tree Oil must come in a dark colored bottle with a dropper top to be effective-(something to do with protecting the tea tre oil from light). Anyway I am going to try this as a preventative for my kids...thanks:) I had purchased the dark glass bottle of tea tree oil, I assume the measurements would be the same as you noted above,right? I actually read the same thing, but it was after I bought the tea tree oil. I took mine into a local herbalist. He said it is fine it just has to be the pure oil to be effective. Yes the dilution would be the same. Thanks for stopping by! 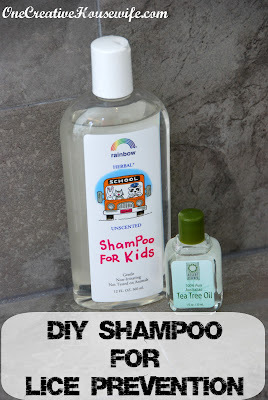 If you have a child in school, Tea Tree Shampoo will help keep lice away. I just battled lice on my granddaughter. Tried dog shampoo, Nix, found live bugs after both. Then I used pure tea tree oil. With each product I caught an adult, smeared a little product in a jar, touched the louse to it and it died each time but only the tea tree oil got rid of all of them on her head!! And of course I have been nit picking tbrough this whole life consuming ordeal. But for us tea tree oil has been the solution. Hope this helps someone else! Where can I buy tea tree oil? Probably a dumb question, but would it be effective if I put it in my daughter's conditioner instead of shampoo? I don't see why it wouldn't work, but honestly I'm not 100% sure. You could always put it in both.